The MSU Parking Office is open Monday through Friday, 8:00 a.m. – 4:00 p.m., excluding University Holidays. All permits must be properly affixed to your windshield before they are considered valid. You must allow for mailing time when ordering a permit on-line. If you live on campus, you must be at least a second year freshman with 20 credits in order to register your vehicle. If you are a transfer student, we require proof that MSU has accepted 20 or more credits from your previous college or university. ALL STUDENTS whether residing on or off campus must register their vehicle with the Department of Police if they operate their vehicles on campus. Please note that permits are not valid for special events. If you change vehicles, you must scrape off your permit and take the pieces of it and your MSU pictured ID card to the Parking Office. They will issue you a replacement permit for a $2 fee. If you are having your windshield replaced, you must do the same. Permits are non-transferable from one vehicle or from one windshield to another. Your permit will likely come off in pieces, save all of the pieces as they must be returned. You may choose to drive your vehicle to the MSU Parking Office and borrow a paint scraper to remove your permit. We recommend having a warm windshield and using a razor blade or a paint scraper to remove the permit. Spartan Village ($133) – for residents of Spartan Village – This permit is not valid in metered spaces, moped spaces, leased spaces, university vehicle spaces, or visitor spaces. This permit is valid 8/15/2018 through 8/20/2019. University Village ($214) – for residents of University Village and buildings 1808, 1809, and 1810 of 1855 Place – This permit is not valid in metered spaces, moped spaces, leased spaces, university vehicle spaces, or visitor spaces. This permit is valid 8/15/2018 through 8/20/2019. 1855 Place ($214) – for residents of 1855 Place – This permit is not valid in metered spaces, moped spaces, leased spaces, university vehicle spaces, or visitor spaces. This permit is valid 8/15/2018 through 8/20/2019. Lot 25/R1 ($320) – for residents of Owen and VanHoosen – This permit is valid in lot 25 or in the employee parking area (upper levels) of Shaw Ramp (ramp 1). If lot 25 is full DO NOT park illegally, instead continue on to the Shaw Ramp to park in the faculty/staff section. Your student ID card will allow gated access to lot 25. Please contact the MSU Parking Office if your ID card is not working. Ramp 1 is the employee permit parking area of the Shaw ramp. Lot 25/R1 permits are not valid in the pay by plate spaces of Ramp 1. A lot 25/R1 permit is NOT valid in leased spaces, in metered spaces, in moped spaces, in University vehicle spaces, in visitor spaces, or in disabled spaces. It is valid in lot 89. This permit is valid 8/15/2018 through 8/20/2019. Lot 91 ($214) – for residents of Abbot, Akers, Holmes, Hubbard, Mason, McDonel, Owen, Phillips, Shaw, Snyder, and VanHoosen – This permit is valid in lot 91. Lot 91 is located on the corner of Service and Hagadorn Road. It is also valid in lot 89. This permit is valid 8/15/2018 through 8/20/2019. Lot 24/R1 ($320) – for residents of VanHoosen – This permit is valid in Lot 24 or in the employee parking section of the Shaw Ramp (R1). It is not valid in metered spaces, leased spaces, service vehicle spaces, university vehicle spaces, moped spaces, visitor spaces, or disabled spaces. This permit is valid 8/15/2018 through 5/15/2019. Lot 89 ($108) – for commuters and also for all students living in the residence halls or in University apartments – This permit is valid in lot 89. It is not valid in metered spaces, leased spaces, service vehicle spaces, university vehicle spaces, moped spaces, visitor spaces, or disabled spaces. CATA has a bus route that runs from lot 89 to the Shaw Ramp every 15 minutes Monday – Friday. This permit is valid 8/15/2018 through 8/20/2019. Lot 65 ($320) – for residents of Armstrong, Bailey, Bryan, Butterfield, Campbell, Emmons, Landon, Gilchrist, Mary Mayo, Rather, Williams, and Yakeley – This permit is valid in lot 65 or in lot 89. It is not valid in metered spaces, leased spaces, service vehicle spaces, university vehicle spaces, moped spaces, or visitor spaces. It is not valid in the employee parking sections of the Brody Complex. This permit is valid 8/15/2018 through 8/20/2019. Lot 15 ($214) – for residents of Armstrong, Bailey, Bryan, Butterfield, Campbell, Emmons, Landon, Gilchrist, Mary Mayo, Rather, Williams, and Yakeley – This permit is valid in lot 15 or in lot 89. It is not valid in metered spaces, leased spaces, service vehicle spaces, university vehicle spaces, moped spaces, or visitor spaces. This permit is valid 8/15/2018 through 8/20/2019. Lot 83 ($214) – for residents of Case, Holden, Wilson, and Wonders – This permit is valid in lot 83 or in lot 89. It is not valid in metered spaces, leased spaces, service vehicle spaces, university vehicle spaces, moped spaces, or visitor spaces. This permit is valid 8/15/2018 through 8/20/2019. CHM / COM / CVM ($169 per semester plus the cost of registering your vehicle) – for all doctoral medical students. You may purchase lot 89 permits, University Apartments permits, and Graduate Assistant permits in person at the MSU Parking Office starting August 13, 2018. You must have your MSU ID card and current vehicle registration with you to purchase a permit. Lines will be long so it is to your advantage to purchase your permit online. All permits must be properly affixed to your windshield before they are considered valid. You must allow for mailing time when ordering a permit on-line. Spring 2019 semester graduate assistant permits will be sold online starting December 10, 2018 at 9:00am. Spring 2019 graduate assistant permits are valid starting December 10, 2018. Summer 2019 graduate assistant permits will be sold starting April 29, 2019. Vehicles with a current and valid graduate assistant parking permit affixed to their windshield may park in faculty/staff spaces south of the Red Cedar River and in the Brody Complex. Parking is not allowed north of the Red Cedar River unless at a paid meter or when the posted employee restriction is no longer in effect. Use of gate cards on north campus is restricted to accessing loading zones for 10 minutes to load or unload. Parking with a graduate assistant parking permit is allowed in lots 62West, 79, and in the Wharton ramp. Graduate assistant parking permits are not valid in lots 39, 63West, and 100. Parking in lots 39, 63West, and 100 requires payment. Parking at any meter on campus requires that the meter be paid. The new graduate assistant parking permits are repositionable permits. The repositionable permit is movable to whichever vehicle is on campus. Each repositionable graduate assistant permit will cost $133 per semester for the 2018-2019 year. You may register two vehicles with the one permit. The vehicle must be attached to the permit in the MSU parking system in order to be valid to park on campus. The permit must be affixed to the lower left, driver’s side windshield of the vehicle that is parked on campus. Only one vehicle is allowed on campus at a time. If you want to add a vehicle to your permit, then you must remove one (keeping only two attached at once) and you must call or come in to the MSU Parking Office to make any changes. If you have your windshield replaced, you must remove the repositionable permit from the old windshield and then place it on the new windshield. If your vehicle is in the shop, then you must come into the MSU Parking Office for a loaner permit. All loaner permits will be limited to one week. Once you have a current and valid graduate assistant parking permit, your MSU ID card should be activated for gated parking access. If you find that it is not working, please contact the MSU Parking Office in person or by phone. The phone operator will need your ID card number which is found on the back of your card, at the bottom. It is a six digit number preceded by an asterisk. Those who are not able to purchase their graduate assistant parking permits online may do so in person at the MSU Parking Office December 10, 2018. You must take your MSU ID card, your current vehicle registration, and proof of your graduate assistant appointment with you (a copy of your offer letter and a print out from EBS) to the MSU Parking Office. Lines will be very long so it is recommended that you purchase your permit online. If you have a repositionable graduate assistant permit and you change vehicles, then you MUST notify the Parking Office by calling or taking in your MSU ID card and the current vehicle registration for the new vehicle. The Parking Office will then remove whichever vehicle that you want from the repositionable permit record and add in the new one. You may only have two vehicles registered with the repositionable permit at one time. You must remember to remove the permit from your old vehicle before you sell it or trade it in. If you have your windshield replaced, then you must remove the repositionable permit from your old windshield beforehand. Then once the windshield is replaced, you may start using the repositionable permit on your new windshield. Fellowship recipients who receive an MSU Fellowship of $1,000 or more per semester qualify for a graduate assistant parking permit for that semester. Qualifying fellowship recipients may not register on-line. They must go to the Parking Office with a letter from their Department Administrator stating that they have a fellowship of at least $1,000 per semester. They must also take their MSU Spartan ID card and current vehicle registration. Motorcycles must be registered in person at the MSU Parking Office. You must take your MSU ID card and your motorcycle registration with you to the Parking Office. The cost for on-campus or off-campus undergraduate students is $108 for the 2018-2019 academic year. Motorcycles (over 100CC) are not allowed to park in moped parking spaces. They must park in a motor vehicle space. You may park in lots 83, 89, or 91 with a lot 89 motorcycle permit. The Parking Office will consider special parking requests from students (including freshmen) for parking privileges other than what is normally issued due to extenuating circumstances, which may include family-, work- or medical-related issues. Persons are, however, encouraged to use existing parking and transportation options [bus (CATA), pay lots, disabled parking spaces (with valid disabled parking placard or plate issued through the Secretary of State or Department of Motor Vehicles, etc.)]. A fee of $169/semester is charged for special parking privileges in addition to registering the vehicle with the Parking Office. If not approved, persons will be directed to use existing parking and transportation options. Summer 2019 complimentary parking is allowed in lots 15, 83, and 91 until 6:00pm on Friday, August 23, 2019. Complimentary parking is allowed in lot 89 until 7:00am on September 16, 2019. Faculty/staff permits can be purchased online at https://permits.police.msu.edu. Academic year employees (AY employees) may only be payroll deducted for the months of September through April and are offered 2 parking permit options. They may select an academic year (AY- 9 month) permit which will be valid August 15, 2018 through May 15, 2019. Payment for the permit can be payroll deducted $50.06/month, September 2018 through April 2019. AY permits are available online at https://permits.police.msu.edu or in the Parking Office. To purchase a permit in person at the MSU Parking Office, you must have your MSU ID card and current vehicle registration with you. If you need to be on campus in the summer, then you will need to come into the Parking Office to purchase a permit parking valid for the period of time needed and pay up front for it. During Summer Semester 2019, complimentary parking is available in lots 15, 83, 89, and 91. Or, academic year (AY) employees may choose to purchase a permit valid through June 30, 2019. The deducted amount will be $66.75 per month (September 2018-April 2019). They are sold online at https://permits.police.msu.edu or at the Parking Office. You must have your MSU ID card and current vehicle registration with you to buy a permit over the counter. Motorcycle permits may not be purchased online. You must go into the Parking Office to purchase a motorcycle permit. Take your MSU ID card and vehicle registration with you. All permits must be properly affixed to your front windshield (lower left, driver’s side, inside vehicle) before they are considered valid, so please allow for mailing time if you order a permit online. The person to whom the privileges are granted is the only person who may park under the privileges, otherwise the privileges are invalid. All permits/privileges and gate access privileges remain the property of MSU Parking and are assigned to individuals. These privileges are not transferable. Unauthorized transfer or use of a permit and/or gate access privileges will result in their/its confiscation, and termination of the privilege(s) for at least the balance of the registration period. Parking violations may also be issued for unauthorized use of the permit and/or gate access privileges. MSU employees who are not graduate assistants, or student employees, may opt to purchase any of the permits described below. Repositionable Employee Permit: This permit allows you to park one vehicle on campus at a time in any employee parking space on campus. Access privileges to gated employee lots are enabled on your Spartan ID card. You will be able to move this permit back and forth between the vehicles that you have registered with the MSU Parking Office but only one may be on campus at one time. The permit is valid only on vehicles registered to your permit with the MSU Parking Office. The cost of a repositionable employee permit is $534 for July 1, 2018 through June 30, 2019. If you choose to add a vehicle to your permit, so that you can park it on campus, then you must call 517-355-8440 or come into the MSU Parking Office. You may pay for your repositionable permit using payroll deduction (if you qualify), cash, American Express, Discover, MC, VISA, or a check or money order payable to MSU. Employee Lot 89 Permit: This permit is valid in lot 89 August 15, 2018 through May 15, 2019. During summer semester and over spring break you may park in lots 91, 89, 83, or 15 complimentary. CATA bus service is available from the commuter lot (lot 89) to the Shaw parking ramp (Ramp 1) during fall and spring semesters. The CATA commuter route transfers from Ramp 1 to other parts of campus. You may ride CATA bus routes numbered 30-39 without paying a fare. The employee 89 permit will cost $108 for the 2018-2019 academic year. You may opt to pay using payroll deduction (deducted from pays of September through April at $13.50 per month). Or you may opt to pay up front for the permit in full using cash, credit card, or a check or money order payable to MSU. Employee 89 permits are only sold August 1 through April 30. If you need to park closer to your work place on a particular day, then you may park go to the MSU Parking Office to purchase a permit for whatever period of time you would like. Or you may opt to park at a meter and pay the meter fee. Or in lot 100 and pay in cash upon exiting. You may also park in pay by plate spaces and pay at the pay stations or by using spoton.msu.edu. The fee to pay by the hour is $1.80 per hour. Driving a different vehicle? Remove and retain the repositionable permit from the vehicle you will be using while your vehicle is in the shop. If it’s a vehicle that you don’t have registered with the Parking Office, then, call or go to the MSU Parking Office and provide the new vehicle information to a Parking Office Service Assistant. You will need to take your MSU ID card and current vehicle registration (or rental agreement) for the vehicle with you to the MSU Parking Office. If all checks out, the information will be updated and you may use the permit temporarily on the borrowed vehicle. Buying, selling, trading in, or turning in a vehicle? Remove and retain the repositionable permit from the vehicle you are selling, trading- or turning in. Call or go to the MSU Parking Office and provide the information on the vehicle you no longer have and/or the new vehicle information to a Parking Office Service Assistant. You will need to take your MSU ID card and current vehicle registration (or temporary registration) with you to the MSU Parking Office. If all checks out, the information will be updated and you may use the permit on the new vehicle. Having your windshield replaced? Remove and retain the repositionable permit before having your windshield replaced. Then place it on the new windshield. Employee permits are not valid for special events. Whenever you go into the MSU Parking Office (to change vehicles, change permits, buy a new permit, etc…), you must take in your MSU ID card and current vehicle registration. If you are a new employee or have a new appointment and are purchasing a new permit, then you must also take a letter on letterhead from the Department Administrator with you. This letter must state your employment status, job title, and start/end dates. Please notify us if you are paid on an academic year pay (8 pays per year rather than 12). If you will be on leave, or are no longer employed by MSU, then you MUST remove your permit from your windshield and return it to the MSU Parking Office so that we can issue you a refund (if you paid in full up front for the permit) or stop collection and payroll deduction of it (if you chose to pay using a monthly pay plan). Permits are not valid until they are properly affixed to your windshield so please allow for processing and mail time and order your permit early. Removing a permit or use of a repositionable permit remains the responsibility of the person to whom the permit is issued. Michigan State University assumes no liability for damage or injury associated with removal of a permit or use of a repositionable permit. Retiree parking permits can be ordered online at https://permits.police.msu.edu. All permits must be properly affixed to the vehicle’s windshield before they are considered valid, so please allow for mail time when ordering your retiree permit online. An MSU Retiree is allowed one complimentary retiree permit for one vehicle. This complimentary permit is provided as a courtesy, and is not a retirement benefit. The person to whom the privileges are granted is the only person who may park under the privileges; otherwise, the privileges are invalid. If a retiree would like to have a second vehicle on campus, then they must go into the MSU Parking Office to purchase a permit for the second vehicle. They will not be issued a second complimentary permit. You may obtain a repositionable retiree permit at the MSU Parking Office but only one vehicle will be able to park on campus at a time, as it must be displayed on the vehicle that you have parked on campus. You will have to move the repositionable permit to whichever vehicle that you have on campus for the day. Only those vehicles registered with the MSU Parking Office may be parked using the permit. You must scrape off and return your single retiree permit in order to be issued a repositionable one. All of the pieces of it must be returned. You also must have your MSU ID card and current vehicle registration with you when you go to the MSU Parking Office. If you now have an employee parking permit and you are retiring, then you must remove and return your employee parking permit to the MSU Parking Office before you will be issued a retiree permit. You must take your MSU ID card, current vehicle registration, and your removed employee parking permit to the MSU Parking Office. Once your employee permit is returned to the MSU Parking Office we will stop payroll deduction of it. If you do not have a current employee permit and are retired, then you may present your MSU Retiree ID Card and your current vehicle registration at the Parking Office to obtain one complimentary retiree parking permit. Please note that at times parking spaces and/or areas may be reserved for special events, and an additional fee will be charged. Retiree permits are not valid on home football game days. You must pay the special event parking fee on home football game days. In order to support and encourage alternative transportation, car pool permits are available for employees that allow the same parking privileges as individual permits but at a reduced cost. In other words, you may park in employee spaces on campus with a car pool permit, but only one vehicle from the car pool may be on campus at a time. While most employees find car pool partners within their departments or buildings, a locator service is provided through a number of websites. You must purchase a car pool permit in person, as they are not available online. All members of the car pool must come into the MSU Parking Office with their MSU ID card and current vehicle registration. One permit will be issued for the entire car pool. The permit must be displayed on the vehicle that is parked on campus, thus only one vehicle may be on campus at a time. The car pool permit must be properly affixed to the inside, driver’s side of the front windshield in order to be considered valid. There must be a minimum of two vehicles registered with your car pool. The cost of the permit will be $22.25 per month per person or $267 per person for a full year permit (July 1, 2018 – June 30, 2019). You may pay for a car pool permit using payroll deduction, American Express, Discover, MC, VISA, cash, or a check or money order payable to MSU. You may purchase a one day parking permit or pay to park in metered spaces, pay by plate spaces or in lot 100. If you choose to pay to park for one day by purchasing a one day parking permit, then you must go into the MSU Parking Office with your MSU ID card and your current vehicle registration. The permit will be valid for one calendar day and will cost $8. If you choose to pay to park in metered, pay by plate, or lot 100, the fee is $1.80 per hour. Payment in lot 100 is cash only. Credit cards are not accepted in lot 100. If you change vehicles for any reason, then you must call or come into the MSU Parking Office in order to update your permit record (remove the vehicle that you are no longer driving and add the new one). We will need to know which vehicle you are no longer driving and also the make, body style, color, and plate number of the new vehicle. If you are coming into the MSU Parking Office be sure to bring in your current vehicle registration and your MSU ID card. When a bicycle is possessed or operated on campus, it must be registered, parked and locked at a bike rack and in operable condition. 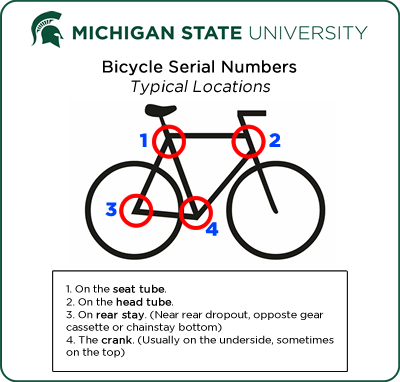 MSU, City of Lansing, City of East Lansing and Meridian Township registrations (permits) are acceptable if current, valid, and adhered to the stationary frame-post below the seat, facing the handlebars. To register your bicycle, you must have the serial number from the bike. This may be found in several places on a bicycle depending on the make and model. The most common location for the serial number is on the underside of the frame, near the pedals. Also, you will need to know the bicycle make, color and whether the style is male or female. There is no cost to you for a bicycle permit. The permit must be registered to you, current, and properly affixed to your bike before it may be considered valid. Bike permits can be obtained at no cost online at https://permits.police.msu.edu. Impounded bikes (improperly parked or not registered) are released Monday – Friday from 8am-3:30pm at the MSU Parking Office on campus. You must take your MSU pictured ID card and proof that you own the bike with you to the MSU Parking Office. Are you an MSU employee and avid bike commuter who only on occasion needs to use a motorized vehicle? MSU faculty/staff may purchase a one day parking permit at the Parking Office or park and pay at meters, in pay by plate spaces, or in pay lot 100. If you purchase a one day permit, it will be valid for one calendar day only and you must take your MSU ID card and current vehicle registration with you to the MSU Parking Office. Not quite so avid, but still want to save some money and do your part in supporting MSU’s green efforts? A number of University employees register their vehicles a portion of the year. For details, please contact the Parking Office. MSU Bikes is a service of the MSU Sustainability division of the MSU Infrastructure Planning and Facilities department. Dedicated to promoting bicycling as a safe, fun, economical, efficient, environmentally friendly and healthy transportation alternative for the MSU campus community, MSU Bikes operates the MSU Bikes Service Center, a full-service bike repair and rental facility. The MSU Bikes Service Center is located under the Bessey Hall auditorium right on the river trail just 300 ft. northwest of the Farm Lane bridge. Students operating a moped on campus are required to register the vehicle with the MSU Parking Office. Moped operators should not ride a moped on the sidewalk. Beginning in the 2018-2019 academic year, mopeds must be parked in designated moped parking areas on campus and must display a current moped parking permit purchased at the MSU Parking Office. These new regulations are in response to a recommendation made by the All University Traffic and Transportation Committee (AUTTC) and the feedback received from students who submitted a proposal at the summer AUTTC meeting in 2017. Please visit the moped information page on this site to learn more about where these spaces are located.